Please accept a free book Exploring Our Baylands with any purchase at our Nature Stores at the Don Edwards San Francisco Bay National Wildlife Refuge. Introduce your child to bird watching and learn how the Christmas Bird Count contributes to conservation at Don Edwards San Francisco Bay National Wildlife Refuge and Coyote Hills Regional Park on January 21, 2017 from 8:30 a.m. – 1:30 p.m.
Go with an experienced birdwatcher and count all the birds you see. We will reconvene at the Don Edwards Refuge to tabulate our data and report our findings. Recommended for ages 8-16. Minors must be accompanied by an adult. Driving to specific birding sites may be necessary. Bring binoculars if you have them, water, and a bag lunch. Get involved in our 30th year celebration! The 30th anniversary of the San Francisco Bay Wildlife Society is on July 30, 2017. Let us know what type of celebration you would like to see. We would like to know our members! Tell us why you have supported the organization and what your ideas are about its future. Take our survey https://www.surveymonkey.com/r/SFBWS-Survey2016 or write to Ceal Craig at ceal.craig [at] sfbws [dot] com. Read more » about Get involved in our 30th year celebration! Snowy Plover chicks banded at the leg. Credit Sebastian Kennerknecht Photography for San Francisco Bay Bird Observatory. In 2017, SFBBO will be going into our 14th year of monitoring Western Snowy Plovers in the San Francisco Bay area. But this year is different: we have no funding for research at their most important breeding site, Eden Landing Ecological Reserve. In the current climate of conservation uncertainty, we are turning to you, the scientific and environmental community, for help to continue our research to save these birds from extinction. Our campaign launches today, December 15, 2016. Visit https://www.generosity.com/animal-pet-fundraising/protect-our-plovers to help us raise $25,000. Even if you are unable to donate, sharing this information with friends and family would be greatly appreciated. We gratefully acknowledge the contribution of Clean Harbors Environmental Services, Inc. who donated $6,000 to the San Francisco Bay Wildlife Society between July 1, 2016 and September 30, 2016. This gift will help with matching funds for the educational display for our Santa Clara Valley Water District trash clean-up grant for Pollution Prevention. 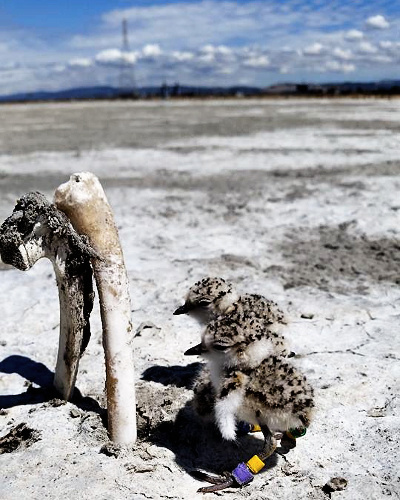 The San Francisco Bay Wildlife Society is a not-for-profit 501(c)(3) Friends Group for the San Francisco Bay National Wildlife Refuge Complex, authorized by Congress to support the education, interpretation, and research activities of the U.S. Fish and Wildlife Service. The San Francisco Bay Wildlife Society seeks to nurture in the public a sense of understanding, appreciation, and stewardship of the San Francisco Bay National Wildlife Refuges, their natural and cultural history, and to support the conservation, preservation, and restoration of the bay lands as essential wildlife habitat. We envision wildlife and its habitat thriving in a healthier San Francisco Bay area as a result of increased citizen stewardship of the environment. Governed by a volunteer Board of Directors, the Society is supported by over 2,000 individual members and by donations and grants from corporations & foundations. The Wildlife Society operates bookstores at the Don Edwards San Francisco Bay Refuge Visitor Center in Fremont and the Environmental Education Center in Alviso. Following a meeting of the Board of Directors on October 19, 2016, Renee Fitzsimons is the new Vice President while Debra King is secretary. Two slots on the Board of Directors remain open. We are looking for more Board of Director members, in particular people with a legal background and business financial experience. Please contact Cecilia (Ceal) Craig at ceal.craig [@] sfbws [dot] com if you want to chat about these opportunities. U.S. Fish and Wildlife Service Don Edwards San Francisco Bay National Wildlife Refuge Volunteer Opportunities: Winter 2016 at the Environmental Education Center (Alviso, California). If you have an interest in wildlife and their conservation, enjoy working with people, and are enthusiastic and dependable, the Environmental Education Center’s Volunteer Program is for you! As a volunteer, you’ll receive on-the-job training from staff and other volunteers in the project area you choose. Project areas are: restoration projects, information desk on weekends, interpretive programs, school field trips, and citizen science/community service. Prior to volunteering at the Environmental Education Center, you must attend a Volunteer Orientation. You can also attend the orientation just to see what opportunities there are, and if it is the right fit for you. 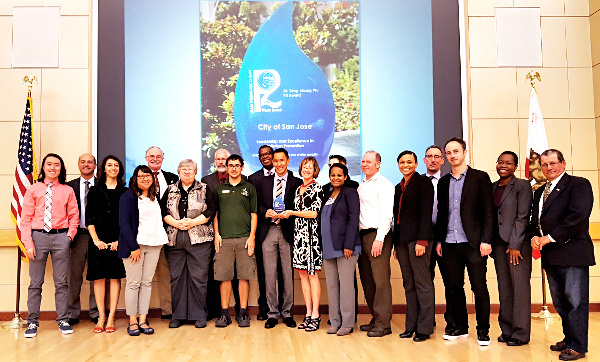 The San Francisco Bay Regional Water Quality Control Board presented the 2016 Dr. Teng-Chung Wu Award to the City of San José for its innovative pollution prevention activities. Kerrie Romanow, director of San José’s Environmental Services Department, accepted the award for the City on September 14, 2016 at a ceremony in Oakland, California. “This prestigious award recognizes the strong partnerships that San José has developed to help keep our creeks and Bay clean; we’ll continue to grow our efforts and keep up the momentum by looking for new ways to protect the environment and serve our community ,” Romanow said. SFBWS Board of Directors President Cecilia (Ceal) Craig at the 2016 WuHoo Awards. Credit San Francisco Bay Regional Water Quality Control Board. The Board of Directors of the San Francisco Bay Wildlife Society is moving through a strategic planning process to develop goals for the upcoming years, and to migrate the organization into a Friends organization for the Refuge Complex. In particular, we want to broaden our focus to include the needs of the four refuges within the Refuge Complex that the Society supports (Don Edwards San Francisco Bay, Salinas River, Ellicott Slough, and Farallon NWRs), and maintain a fruitful collaboration with the Friends of San Pablo Bay who assist the other three refuges in the North Bay (San Pablo Bay, Marin Islands, and Antioch Dunes NWRs). Much is happening around San Francisco Bay such as the next phase of the Salt Pond Restoration efforts at the Eden Landing ponds in Hayward; Measure AA and its impacts on upcoming restoration efforts; the Shoreline Levee Project; habitat restoration and associated studies; environmental education and stewardship projects; recreational improvements such as interpretive mobile apps; and much more. Come celebrate National Wildlife Refuge Week this year from October 9 through October 15 at the Don Edwards San Francisco Bay National Wildlife Refuge. Take part and learn how national wildlife refuges conserve and protect wildlife and habitat through science, interpretation, and recreation at the Refuge Headquarters in Fremont. On October 15, drop by the refuge to view critters that live in the sloughs and mud that form the basis of our food chain, see the beauty of San Francisco Bay by going on a Bay Bike Ride, or take a relaxing stroll at dusk to view the setting sun. Take part in some or all of the activities listed below.